Ethan and Charlie do everything together. They play ball, build forts, and watch their favorite shows. They’re the best of friends with a bond that transcends species or language. Their connection also breaks down barriers of prejudice and discrimination because, you see, Charlie is a Pit Bull. Adopted as a young pup, Charlie is a beloved member of the family. 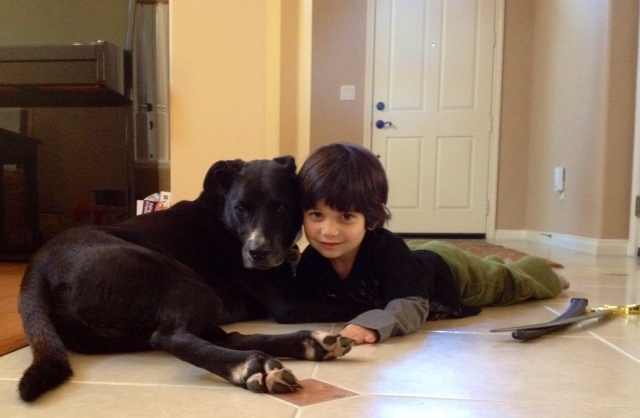 Being a black Pit mix, he’s pretty lucky to have ended up with an adoring family and a best bud like Ethan. Although their mom is always around when they’re together – as we recommend kids ALWAYS be supervised around dogs no matter what breed they are or backstory they carry – when these two are together they’re in a secret world all unto themselves. They cuddle on the floor, they snuggle on the couch, they just hang together like a couple of bro’s, like there’s no one else in the world but each other. Ethan is only four years old, but he already knows that Charlie is someone worth cherishing. They give each other tremendous comfort, a special kind of companionship, and love. So much love. Do you know a Pit Bull who’s got a kiddo for a best friend, too? Share your stories and celebrate these magnificent dogs who are too often and too sadly misunderstood. For more inspiration, check out this awesome Pit Bull video made by Angel City Pits, a fantastic rescue group in Los Angeles! We applaud the lifelong friendship Ethan and Charlie will enjoy, and look forward to a day where all dogs, regardless of breed, can be this fortunate!